Ohio Lumber Brick and Block specializes in pole barn sales. Anything from a 90x250 horse arena to a 30x48 storage barn and everything in between. Call us for your FREE estimate or email one in using our request a quote future on this website. We can build your dream pole barn. Like the looks of wainscot or the benefits of 3ply post construction? Ohio Lumber Brick and Block has you covered. We have custom built hundreds of pole barns and we would love to help you build yours. We supply you with 3-d imagery and detail plans of your building before construction. We pride ourselves on quick build times and a quick turnaround time from design to build date. Contact us at Ohio Lumber Brick and Block today to get your pole building project started. 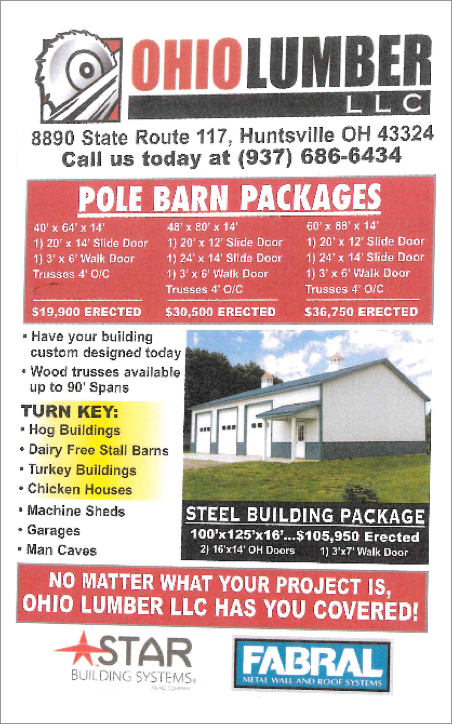 Need A Pole Barn? Let Ohio Lumber Brick & Block Help You Out! See some of the Agriculture Buildings we've constructed! More images coming soon! See some of the Horse Arenas we've constructed! More images coming soon! See some of the Storage Barns we've constructed! More images coming soon!